It’s time again to stretch some musical boundaries with another ‘Trio of Five’ night this Friday, 7th August at The Armidale Club. 5 musicians, 3 ensembles – hence the name**! 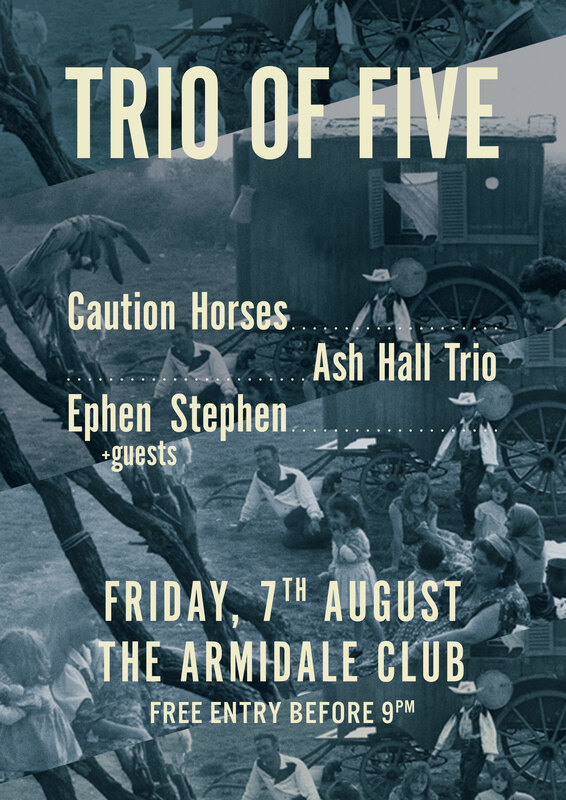 EphenStephen will kick off the proceedings, accompanied on a couple of numbers by Steve Harris and Ash Hall (guest artists from Caution Horses and The Ash Hall Trio), followed closely by The Ash Hall Trio featuring Ash Hall (trumpet), Tony Elder (vocals) and Steve Thorneycroft (guitar). Caution Horses will round off the evening – Steve Harris (drums & percussion), Ash Hall (trumpet) and Stephen Tafra (oud, banjo, fretless guitar, accordion). We’ll make sure as many musical stones are turned as we possibly can!